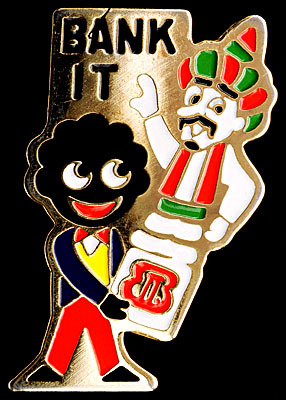 The Bank It brooch was issued in 1982. It features Golly and the genie in the bottle, Ali Jamja. It was used to promote the use of bottle banks. 2 promotional lids and 20p had to be submitted to Robertson's. "This jar can be recycled  bank it at a bottle bank" were the instructions on the jam jar lid. The genuine Robertson's Bank It badge has nothing on the reverse. Beware: a known fake of the badge has also been produced which bears the backstamp Replica 2003.